Of the different processes for applying colour to textile products, yarn dyeing is a standard procedure boasting a number of advantages. 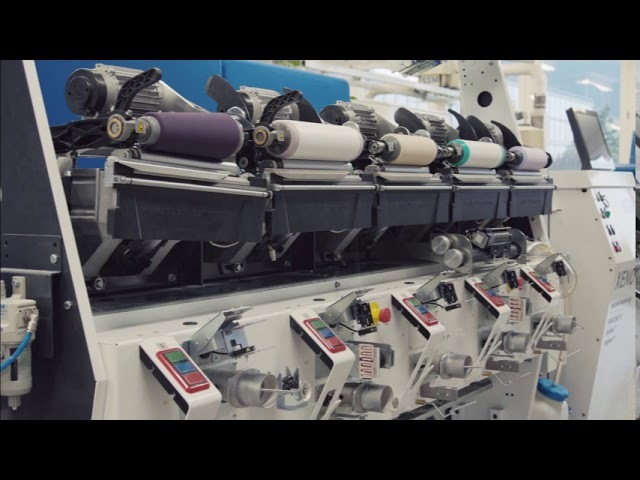 The fact that it can be integrated into various textile process sequences and has hardly any limits with regard to yarn, emphasises the versatility of package dyeing. Economic factors often weigh heaviest. Package dyeing with its relatively small number of process stages, involves correspondingly low costs. Considering the speed of response to market demands, textile manufacturers benefit from the high flexibility of the process. The XENO-YW is a precision winding machine for all kind of staple and filament yarns suitable for dye package winding, warping preparation and rewinding with or without lubrication or waxing. 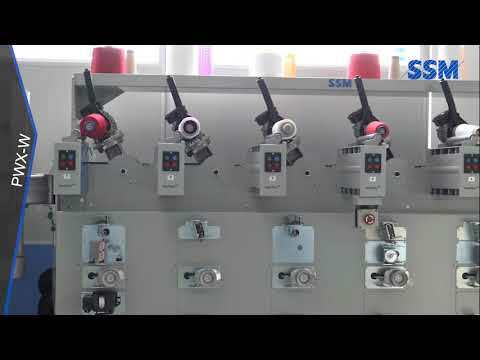 Due to the unique machine design, SSM can offer a versatile machine for both, muff preparation (cone to muff) as well as unrolling of the muffs after dyeing (muff to cone). For the customer this results in higher flexibility, lower investment costs and last but not least, more profit. The residual elasticity of high elastic Polyamide (PA) and Polyester (PES) draw twist textured yarns (DTY) after dyeing, strongly depends on how the yarn has been wound and dyed. Package dyeing enables a good dye quality but reduces the elasticity. For certain yarns this is sufficient, but for high elastic filament yarn not. For this application, muff dyeing is the best solution. The XENO-FW is a precision winding machine for all kind of staple and textured filament yarns suitable for dye package winding, warping preparation and rewinding with or without lubrication or waxing. The SSM XENO-BW is a precision winding machine for all kind of staple fibre yarns. The machine is equipped with the latest edition of counter-rotating blades for gentlest yarn treatment. 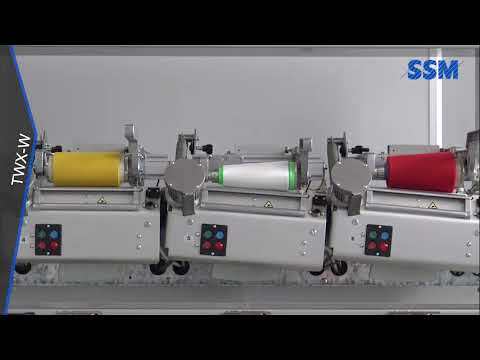 The SSM DURO-TW precision winder for coarse technical yarns up to 50000 dtex offers a new level of flexibility and winding quality in one machine; thereby ensuring the fulfillment of all customer requirements. 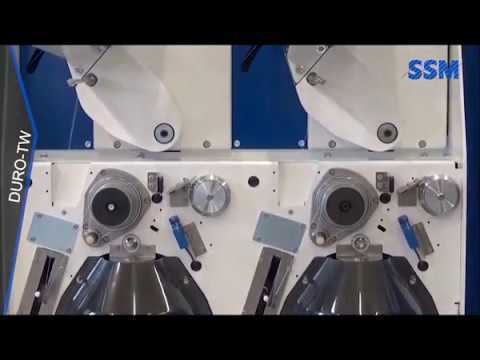 The SSM TWX-W is a precision package winder for dye-packages and rewinding applications. The electronic fastflex™ yarn laying technology allows a high flexibility to produce a made-to-measure crosswound packages. The well-proven technology cuts maintenance and service costs to a minimum. digitens™, the established technology for online tension control during winding enhance the winding performance and package quality. Only a quick response to market trends in combination with high cost-efficiency enables yarn dyers to be successful with competitive advantages. The PWX-W offers clear benefits to dye package winding and rewinding of filament yarns, with or without lubrication. To maintain a high residual elasticity of elastic Polyamide (PA) and Polyester (PES) draw textured yarns (DTY) after dyeing, the muff dyeing process with integrated SSM leading yarn winding technology is the best solution. The new SSM PWX-CTM enables the preparation of low-density muffs, while maintaining the highest possible elasticity of the yarn throughout the dyeing process. The SSM PWX-MTC is the ideal machine for rewinding of high elastic Polyamide (PA) and Polyester (PES) draw textured yarns (DTY) after dyeing. The online tension controlled, positively driven unrolling system precitens™ offers the highest flexibility and productivity. SSM can offer the proper solution, regardless whether muffs, hanks, dye packages on dye tubes or coreless dye packages are to be rewound. 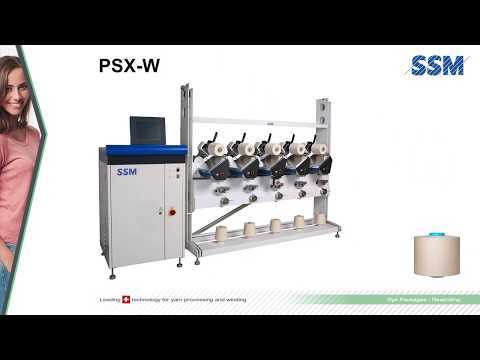 The SSM PSX-W is a precision package winder for dye package winding and rewinding. The PSX-W is suitable for all kinds of spun yarn. The high productivity and reproducibility resulting in a minimum off-shade dyeing are the significant advantages for any dyer. 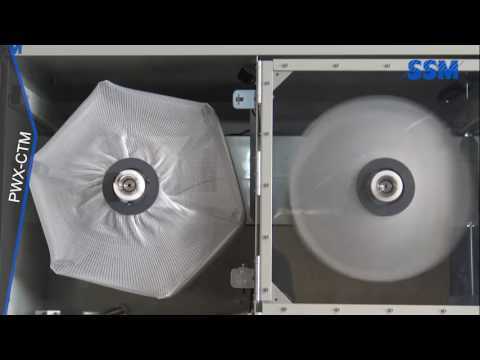 The decisive success factor of the PSX-W winder is its unique thread laying system by means of counter-rotating blades, which has established itself as the system, gentlest to the yarn. The rotating motion of the blades is practically wear-free and ensures highest production speeds at lowest possible operation costs. The CWX-W, the new energy efficient drum winder is a rewinding machine for cones used in the weaving, warp knitting and circular knitting process. Featuring a new developed and single controlled BLDC drive, the SSM ClassicWind™ drum and an electronically controlled magnetic tension device suitable for winding various types of staple yarns. The CW8-W is a cone to cone winding machine for the preparation of weaving, warp knitting and circular knitting process. Innovative solutions, rugged technology and application of the essential allow an optimization of the thread path and the simplification of the winder. The economical and enduring technology cuts maintenance and service expenses down to a minimum. The CW8-W allows the adaptation of the winding to various types of staple yarns. Rotating self-cleaning tension device and dry waxing device reduce yarn friction to a minimum.